Property 16: 1927 South Ridge, Spacious 4 Bedroom End Unit, Pond view, Short Walk to Pool! Property 20: Stay here for YEAR ROUND family fun! Property 33: Walk to Slopes Fabulous Mountain Home in Hidden Valley! Property 34: 7 Springs Mt. Villas - Ski, Golf, Relax! Free Shuttle To Lodge, WiFi Included!! Property 38: 1515 Tailor, Short Walk to Slopes, Close to Pool and Playground! Property 45: Great Golf Or Ski Getaway! Walking distance to Both! Property 47: 1839 Eagles Ridge, Newly remodeled, Wifi! Short walk to the pool, playground! 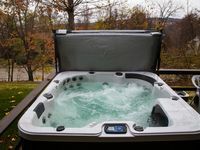 Property 48: Cozy Southwind Seven Springs Home, Ski-In/Ski-Out! Property 49: Best location to the ski lodge and slopes! Communication was easy and quick. Place was well stocked, clean and had everything that we needed. I would stay here again.